The following guide is based off of community provided knowledge and data. I take no credit or claim ownership of the information below, just tidied it up to the best of my ability for the community Please take advantage of the information that is both here and the google sheets checklist for your personal use. (not counting Time Limited, War Avatar, World Quest or the Celestial Vale title sets). To obtain a google spreadsheets checklist and stats calculator go HERE UPDATED!!! 1. Make sure you have the title quest "tracker" visible on your screen. 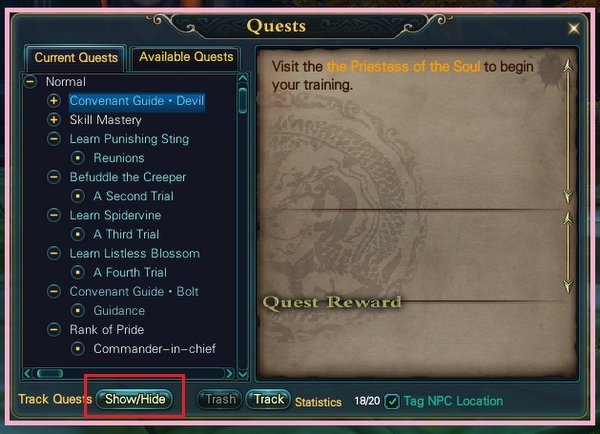 You can gain access to this by opening your regular quest log (Pressing 'Q') and hitting the "Show/Hide" button at the bottom of the screen. 2. Once you have the quest list on your screen, click the "Title Quest" Tab on the top right. This will allow you to autopath to most mobs, dig spots and quest objectives. 3. To accept a new title quest you will need to look for a flashing scroll icon at the top of your screen by the mini-map. This shows that a new Title Quest is available for you to accept into your Title Quest Log. 4. In order to accept title quests you MUST complete previous title quests in the quest "chain" (each section in this guide) before being able to continue on to the next one. You can however complete each section in any order you wish. 5. Always make sure you are on the ground if you have not been able to get a quest to pop. Some quests do not pop up while flying, and any quests that must be recieved at any height other than ground level should be noted in the directions in this guide. 6. If you are 100% sure you have received the title for the last step in the quest and are on the ground but cannot get your next title quest icon to flash or "pop", try to walk around in a circle about ten steps around the given coordinates. Sometimes the quests can be finicky and require you to walk a bit to get them to come up. 7. Check your regular quest list. There are a few instances where the title quest has a regular quest mixed in with it which can be quite frustrating. One example of this is in the Harshland's title quest. I try to mark this in the guide where possible. 8. If you've followed the suggestions above and still cannot get your next quest try logging out to the character screen and logging back in. This is especially important if you have the quest "pop" but you are unable to accept the quest. This is a bug I've encountered more frequently lately and can be fixed by either a log out/in or a full restart of the client. (i) Obtain Seal: Harshlands by teleporting to Snowy Village at (149 960) and accept your first title quest! (vi) Travel outside the entrance of Frostcovered City at (120 968). A normal quest will pop up at (120 971), asking you to go inside. (You will get a NORMAL quest in the regular quest log called 'investigate frostcovered city', NOT a title quest). Enter FCC. (viii) Go close to the entrance of Eden, (163 992) or (162 994) on the ground, just next to the Entrance on the ground, you will get a NORMAL quest asking you to go inside. (ix) Go inside Eden to complete the NORMAL quest. Clear up to 'Phlebo' and stand next to the pillar of duty (381 594) to get the quest. (i) Teleport to Avalanche village (325, 972) to get the Seal: Canyon and your first quest. (i) Got to (204 973) (just above the water) to obtain Seal: Frozen River. (i) Go to the entrance to FB19/Volcanic Purgatory (396, 992) to obtain Seal: Volcanic Purgatory. (i) Go to (541 957) across from Haunted Path to obtain Seal: Tai Chi Shore. (iii) Go to (630 651) to pick up the next quest. Kill 15 'Barnacles'. (iv) Go to (655 641) to pick up the next quest. Kill 10 'Clam Scout' and 10 'Drifting Hex Lantern'. (vi) Head towards the Village of Naught (676 619) to pick up the quest. Talk to the 'Crippled Soldier'. (vii) Head west towards the gulf and land on top of the ship to pick the next quest at (642 614). (i) Go to Allies Camp (613 713) to pick up Seal: Widow's Coast. Dig the 'Suspicious Barrel' to complete the quest. (ii) Activate the 'Suspicious Package' to obtain the seal. (iv) Head out of Allies Camp, towards Widow's Coast (633 724) to pick the next quest. Kill 25 'Skelevizen Sailor'. (vi) Head towards Mount Lantern (644 763, 30) to pick up the next quest. Light up the Lantern to finish the quest. (ii) Go to South Barrier Village (149 818) to pick up the next quest. Talk to Apothecary Hsiao (147 813) to complete the quest. (viii) Go to (174 914, 23) to pick up the next quest. Kill Arcane Ocular (185 920, 37) at the mountain peak. Boss has 800k Hp. Soloable with endgame gear and/or rebirth levels. Beware of strong pdef/mdef debuff. (x) Head towards North Barrier Village (156 894) to pick up the next quest. Find Ching Yin (159 905) to complete the quest. (i) Go to (118 645) to receive Tome: Dragon Wilderness. (iv) Go to (137 680, 46) to pick up quest. Dig the “Dorim Codex” from “Dorim Announcer” at (135 675). (vi) Go to (180 675) to receive the next quest. Kill 3 “Distant Dustwraith”s at (187 670). (i) Travel to Courage Path at (380 536) to receive Mystery Page: Courage Path. 1. [Aviator](+3 phy-att): Fly to an altitude of 79"
2. [Green Wood Song](+12 evasion) Begin gold quest at PWI Promotion Agent called “Dragon City Diplomat”. Follow quest chain to completion. 3. [Marshal's Deputy](+5 mag-att) Stand on the Pirate Ship (626 659)(20:00 - 22:30 Fri & Sun). 5. [Pureheart](+2 phy-att) Go to: (577,628) - wait one minute. This one can be tricky to get the quest to pop. Make sure you are all the way to the ground under water and wait. Next, go to (521,665) and dance. Go to (541,618) and think. Go to (586,620) and blow a kiss. Go to (585,669) and meditate. 6. [Supreme Dedication] Miss less than 3 sign ins a month for a year. 7. [Supreme Lord of Dedication] Gain perfect attendance for a year. 8. [Moonwalker] Collect 5 'Cases of Moonlight' from the Mid-Autumn event. 12. [Hero of Elysium] Redeem an Elysium gift pack from the PWI Twitch Stream. 13. [Homeless] Get locked out of your homestead! 14. [Rednosed Reindeer] Exchange 5 Snowman Pasters with the PWI Promotions Agent. 15. [Party In My Homestead!] Award for winning the Homestead Design Contest. 16. [Penguin Errand Boy] Hand in 5 Brine Fish, Time limited Christmas Event title. 9. [Demon World Traveler](+12 mag-att)　Kill Borobudur Dungeon Lord within 60 minutes. (Aba Weekly). 11. [Twilight Dawn](+10 phy-att, +10 mag-att)　Complete Dawnlight Halls in Judgement mode. Notes about Neverfall Quests: These side-quests do not become available until previous side-quests in Neverfall are completed. Begin with the side-quests "Girls Gone Missing" and "Love Cookies" and Complete side-quests in Neverfall as they appear in your "Available Quests" until you receive the quest "Help From Above". Thank you so much eirghan! This is perfect! And thanks to sylen for giving this the sticky status it deserves. Nice job on this! Looks pro. Can you change the color of [Saint Savior] from green to blue (uncolored)? That was an error that was introduced at some point that was never corrected. Thank you for the thread. I have a small issue with the Seal: Frozen River. I cannot dig the gold brazier. Do you know anything about this and how to fix it? "2. [Mulberry's Aid](+12 evasion) Complete the prerequisites for reawakening." This is wrong. This title is awarded by completing a lvl 100+ quest that starts at the PWI Promotions Agent, called "Pestle of Reincarnation" (I think not sure about the exact title). It is independent from rebirth. And Tome: Silk Ridge is missing. And StoneSnake - CatSnakeshop for everyone's Common Stones and more! Mulberry's Aid is still given from the same location. The quest description was given from the actual quest text as documented here. The quest is called "Pestle of Reincarnation" which is where this text comes from. It is a quest about "Rebirth" or "Reawakening" but not as we know the terms to be used today. Since there seems to be a lack of clarity I have added that the quest begins at the PW promotions agent and given after completing the quest chain "Pestle of Reincartion Celestial". Tome: Silk Ridge does not exist, it is actually a Seal title chain as documented here. You can find this title chain at the end of the "Seal" section. someone in my faction told me that it can be dug at 1:00 or 8:30 server time, but i forgot to ask if it was AM or PM. When I did this chain I had an issue with this quest resetting and disappearing from my title quest log. If you are having the same issue, when you autopath to each of the locations and dig, for some reason the quest will disappear. I was able to work around this by moving manually between the points and sticking close to the ground. Please let me know if this helps! I will do the chain again on an alt later this week to verify that this is still an issue and a work around. I can't find anything in regards to a time limit but after looking on PW database it's verified that you are not allowed to leave a certain section. If you do, the quest will fail. Hello how to get [Supreme Dedication] title ?. i don't know how to do. So pls somebody explain me. This post doesn't even deserve a response. Use CTRL+F for a page search. The worst thing in title quests is: there's no way to organize the quests you already made and don't. I have a lot of 'Books' I can't go ahead because a strong boss is needed, so I left for when I'll be strong enough. Who do you turn in the Title: Returning Warrior item to, to get the title? I haven't been able to figure it out, and right clicking it does nothing. [color="#ff0066"]@calorien Its an automatic title. If you have the item in your bag you can just trash it, it seems to be an error that it remains after the title is gained. The step that states go to 400, 675 was not used at all and can be omitted the next step listed in Title Quest available was Go to 394, 680 for Shrieking Banshee.